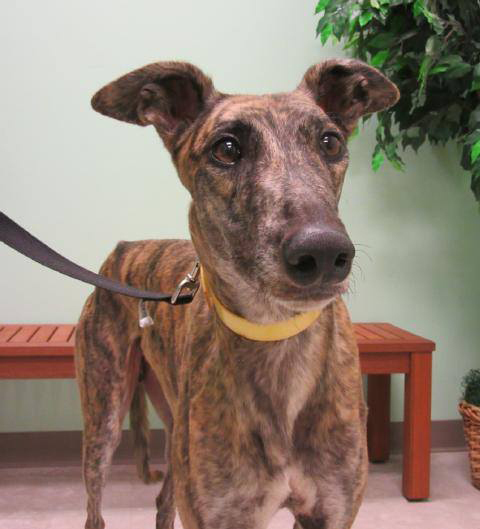 Trey originally came in from the Goodman Kennel at the Sanford Orlando Race Track. He is a small 68lb brindle male that will turn 5 on August 26th. He also raced briefly at Derby Lane early in his career. He was a top level racer in Orlando competing and winning at the top A level against the best dogs at that track. Trey's trainers were very attached to him and planned to keep him as a personal pet after he retired. They rescued a small dog from a bad situation, so weren't able to keep another dog when Trey finally retired though. When he first arrived at their race track kennel he was very shy and overwhelmed. They worked him through that and helped him build his confidence in the year and a half he raced with them. His trainers said he was the absolute sweetest boy once he warmed up. He was really upset when the hauler came to take him out of the kennel to bring him to us and he had a moment of panic. He was better by the time he reached us and didn't tuck his tail or really seem shy at all. He seemed to be adjusting to home life remarkably well in foster care and didn't seem like a really shy dog at all. He was in an adoptive home since November, but progressively got more and more fearful with the family and even developed a fear of the yard. Trey spent a lot of his time in the bedroom away from everyone so eventually they decided that he would do better with another family. Trey is not shy with other dogs large and small and has lived with both. We would prefer not to put him in a home with children since they can be loud and scary. We think he probably needs a quiet home that will let him initiate contact when he is ready. Trey's sire is Odd Ulysses and his dam is Topaz Sallyhally.